A Big Sale, A Free Transfer, and New Products! Our Mascot Mega Sale is going on now! Stock up on mascot words and images at 25-40% off and give personalized gifts to teammates, coaches, or fellow fans this Christmas. 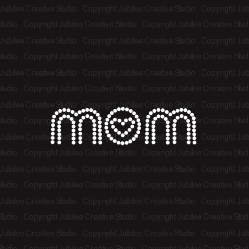 AND simply enter coupon code “mom” at checkout to receive this FREE Mom iron on rhinestone transfer with any purchase! Pair it with our mascot words or images to show how proud you are of your son or daughter on your favorite team. Make sure you check out our New Products page to view the new designs that have just arrived in the Studio! We’re excited about these new products! And keep checking the page — more Christmas designs are coming soon! !